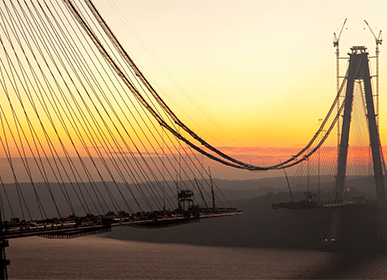 Hailed as a “symbol of modern Turkey”, the 3rd Bosphorus bridge is the widest suspension bridge in the world. An engineering project of this size required having the right people and resources and a quality planning software. Powerproject was chosen as the software to underpin the project due to its ability to track planning amongst a large number of stakeholders and it helped the planners understand the project’s status in real time. Powerproject was used to support the planners at each stage of the project. The technology ensured that they kept the project plan live and always responded to any updates or changes, so that their estimates remained accurate. An important part of the planning, especially on a project of this scale, was to ensure realistic estimates and to have pre-mitigation and post-mitigation plans in place at the very early stages. With a large number of international partners, designers, subcontractors, and material suppliers in the same project, as well as the 7,500 people involved on the construction side, collaboration was crucial to achieving goals in a megaproject like this. Defining the right project strategy, implementing successful and transparent planning and building up healthy communication between project stakeholders were all tactics used to ensure that everyone was working towards the same common goal and with the same understanding. The reporting capabilities of Powerproject helped to keep everyone involved informed at all stages of the project.